Director: Simon KinbergWriters: John Byrne, Chris ClaremontStars: Sophie Turner, Jennifer Lawrence, Jessica ChastainSummary: Jean Grey begins to develop incredible powers that corrupt and turn her into a Dark Phoenix. Now the X-Men will have to decide if the life of a team member is worth more than all the people living in the world. For more on the production of Dark Phoenix click here to go to the Wikipedia page. Dark Phoenix (also known as X-Men: Dark Phoenix) is an upcoming American superhero film based on Marvel Comics' X-Men characters, produced by 20th Century Fox and distributed by Walt Disney Studios Motion Pictures. It is intended to be the twelfth installment in the X-Men film series and the sequel to X-Men: Apocalypse (2016). The film is written and directed by Simon Kinberg, and stars James McAvoy, Michael Fassbender, Jennifer Lawrence, Nicholas Hoult, Sophie Turner, Tye Sheridan, Alexandra Shipp, Kodi Smit-McPhee, Evan Peters, and Jessica Chastain. 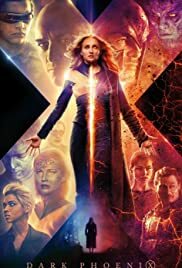 In Dark Phoenix, the X-Men must face the full power of the Phoenix (Turner) after a mission to space goes wrong. After X-Men: Days of Future Past (2014) erased the events of X-Men: The Last Stand (2006) from the series' timeline, Kinberg expressed interest in a new adaptation of Chris Claremont and John Byrne's "The Dark Phoenix Saga" in a future film that would be more faithful than his previous attempt with The Last Stand, which was not well received. The new adaptation was confirmed as a follow-up to Apocalypse in 2016. Kinberg signed on to make his directorial debut in June 2017, when the majority of the cast was set to return from Apocalypse. Filming began later that month in Montreal, and was completed in October 2017, with reshoots taking place in late 2018. Dark Phoenix is scheduled to be released in the United States on June 7, 2019. This entry was posted	on Sunday, March 31st, 2019 at 9:07 pm	and is filed under Movie List, Movie Trailer, Movies, Trailers. You can follow any responses to this entry through the RSS 2.0 feed. You can leave a response, or trackback from your own site.